Hello! 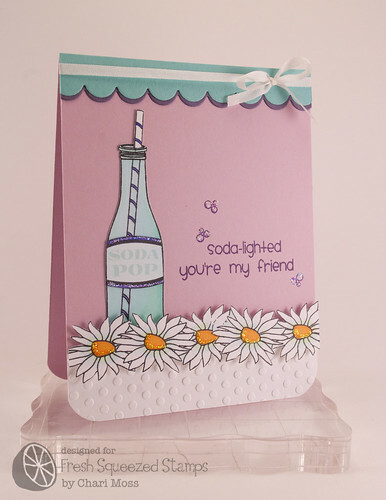 Today I am happy to be helping the creative ladies at Fresh Squeezed Stamps with their November release week! 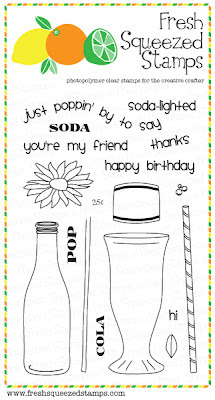 Today we are introducing the new set Soda-lighted which is a great set with some Punny sentiments and fun images to go with them. Here is what I created with this set from Fresh Squeezed Stamps. I did some masking to create the line of flowers along the bottom and cut them out and popped them up from the card base. The bottle I colored with copic markers and the label I stamped and cut out separately and adhered on top of the bottle. The "Soda Pop" words are stamped in soft pool ink for the faded look. 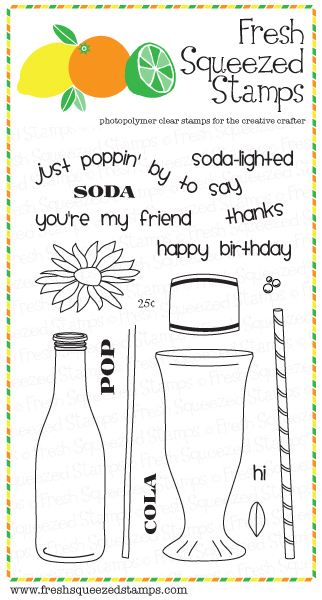 Be sure to visit the Fresh Squeezed Stamps blog because they are giving away a free Soda-lighted stamp set today.